A very good little tale of Irish bravery during the Civil War! My son was in the 69th Infantry( Fighting Irish) New York National Guard, when it detailed a platoon to serve with the 108th Infantry NYNG, in Afghanistan in 2007-08! His great-grandfather served with the 69th in World War I. The Irish, can’t have a war without us! Many thanks! That is a fantastic record of family service, and one to be proud of- it is great the 69th still going strong and still adding to its illustrious record! in Brookline Massachusettes. I found it fitting that 2 officers one being my dad a Captain also in the USMC where buried on a hill across from each other. 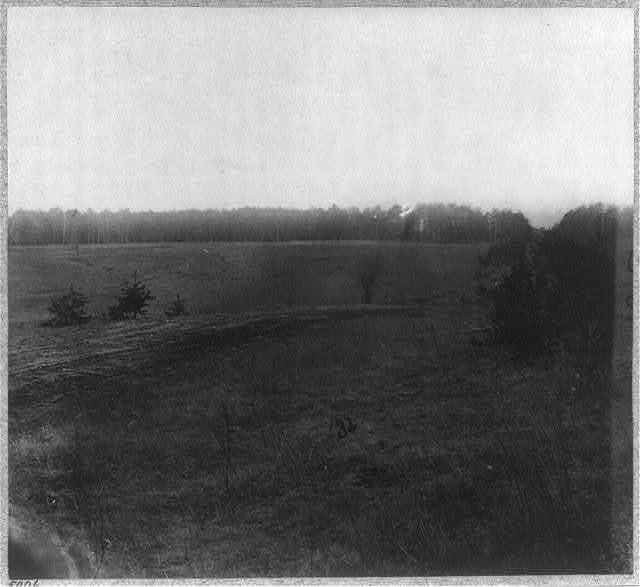 With the help of sites like these I have researched that Capt Macnamara gave his life in Saunders field.I plan to take a trip to this area this summer, does this battleground Saunders Field still exist to vist? That does seem very fitting indeed. You will be glad to know Saunders Field does still exist so you will be able to visit the area- check out this link at the Civil War Trust site they discuss the Saunders Field and also ongoing preservation efforts: http://www.civilwar.org/video/battle-of-the-wilderness.html and also you can find out about driving tours etc. of the area at the NPS website here: http://www.nps.gov/frsp/index.htm I hope you have a successful trip! I have not yet had the honor of visiting Hollyhood Cemetery. I have, however, recently visited Saunder’s field in September 2011. Even after reading many accounts of the battle, there is nothing quite like being there and seeing the terrain those brave men faced as they charged up the hill. 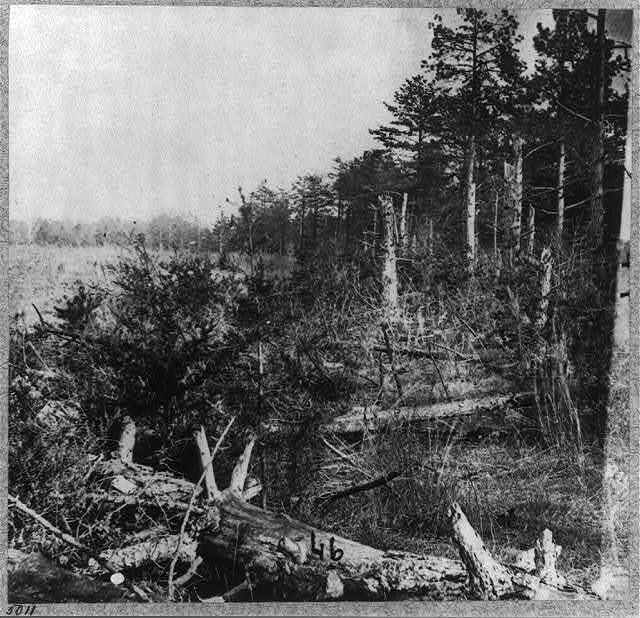 The Confederate breastworks are still visable near the tree line and one can easily see how the brave men of “The Fighting 9th” were entrapped. You might want to read “The History of the Ninth Regiment”, written by James Macnamara’s brother Daniel, if you have not done so already. It is an excellent account of the Ninth’s contribution to the Civil War. I have a special interest in visiting Hollyhood Cemetery as my Great, Great Uncle, Col. Patrick R. Guiney, is also burried at Hollyhood. I would also be honored to place a wreath in honor of your Father. Thank you for your comments .I was not aware that Capt.James Macnamaras brother Daniel as the author of that book about the ninth Massacusetts.If you happen to go to Hollyhood Cemetery the grave is near the front, from main gate entrance first right and first left 100 feet or so on the left heading up a hill maybe 50 feet up from the road. The limestone grave is next many Irish sur names. My father and now mother is a little further up 1row over. My great grandparents are also close by.I grew up on Heath St. same street as main gate close by. I have yet to come by any other grave markers from the cival war but im sure there are some.President Kennedy parents are buried further down the same road. My Great Great Grandfather was in the 9th Regiment, killed on May 5th. He’s listed in the post – Private John Flanagan of Company C. He left behind his wife and his only child, a son. Thank you for posting this, it’s a reminder of their bravery and sacrifice. Many thanks for getting in touch, it means a lot that you enjoyed the post. I find the 9th Massachusetts a fascinating unit- what they endured in those brief few minutes is beyond comprehension. Do you have much information on John’s life? Thanks for responding…I know he was born in Ireland (not sure where as of yet), and he lived in Milford, MA. He was a bootmaker by trade, and he enlisted in August 1862. I just found out today while looking through an old family Bible that he actually had 3 children, I mentioned he had an only son in my previous post. I continue to do more research, and I hope to make a trip to the battlefield this summer. I would be really interested in how you get on over the summer, and if you make the battlefield- if you were interested some of the photos and your thoughts on visiting the field would make a nice follow on post. Thank you so much for this article. I’ve just recently discovered that my Great Great Grandfather John Ferris was killed in this battle. To read the account made my heart ache but coming from a family who have served our country I understand the sacrifices. I hope to visit Saunder’s Field soon. When I see the legacy he left behind (6 more generations) I’m amazed. Again thank you! I am really glad to hear from you and that you enjoyed the article. I find the 9th at The Wilderness one of the most affecting of stories (I have actually included it in my new book!). I find the regiment fascinating in every respect. Are you aware of the books available on the Ninth? Check out the ‘Resources’ page of the site and you will see a list of books, a couple of the histories of the Ninth are available online and have links there, you will get further details on John in the 1899 history. Thanks again for posting.